How does it feel to wake up in the morning with a stiff, sore neck that is hard to move and stabbing pain in the back and arms? Not great, definitely! A neck pain is dangerous in the sense that it won’t stop there and will grow into something severe like sciatica, chronic back pain, and numbness in the arms and legs. Most people blame their mattress for the neck pain but the culprit here is the pillow. The sleeping position also plays a minor part but it is mostly because of the wrong pillow. 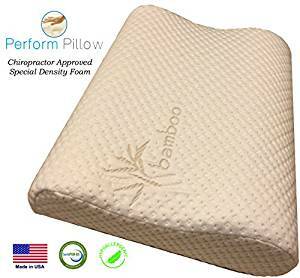 If you want to get a good night’s sleep and don’t want to deal with the by-products of neck pain, you will need a good-quality pillow that is specially designed to support the neck. We have also written a complete guide about the best pillows for backpain. Is There Any Sleeping Position to Avoid Neck Pain? What are inside the neck? Well, it is made of seven tiny bones (also known as the cervical vertebrae) and numerous muscles, tendons, and cartilages. Together these support the head and neck and protect the central nervous system. The neck is a vulnerable place and a bad sleeping position can hurt the nerves that run up and down from the brain through the cervical column to all the body parts. Two sleeping positions are the most helpful in keeping the neck straight – on the back and the side. A round-shaped pillow with a relatively flat cushioning will best support the natural curve of your neck for a back and side sleeping postures. 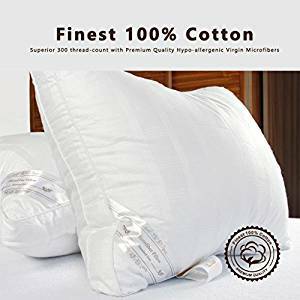 There are some pillows with built-in neck support and an indentation for the resting head that you can use or tuck a small neck roll into the pillowcase of a flatter pillow. Side sleepers should use a pillow that has a bulge under the neck instead of the head for keeping their spine straight. Use a horseshoe-shaped pillow when you are traveling, reclining to watch TV, or sit somewhere for a long time. It will keep the head and neck at the right position and prevent the side-dropping of the head when you doze off. The pillow should not be extra-large as it will force the head frontward and cause discomfort. Don’t sleep on a pillow that is hard or too high because it will cause the bending and too stretching or contraction of the neck overnight. The ultimate result will be a stiff and aching neck in the morning. Sleeping on the belly is an unhealthy posture as it keeps the back arched and the neck turned to the side. So, practice the healthy habit of sleeping on the back or the side. Read our complete guide about the best orthopedic pillows. Back sleepers need a thinner pillow with a convenient loft in the bottom third area to cradle the neck. The thinner surface will help the head to be in parallel with the neck. The side sleepers need a slightly firmer and thicker version to fill in the gap between the ear and outside shoulder. A highly thin, almost flat pillow will be the best solution for stomach sleepers. The posture is harmful to your spine. If you can’t change it, tuck a pillow under your belly at least to avoid lower back pain. Down/Feather – Pillows made with these ingredients are the best for ensuring a good night’s sleep. They are firm but soft, and you can move the filling around to get the support where you need it the most. Foam – The foam density determines the amount of the comfort you are going to get from the pillow. The higher the density, the better the support because there will be less breakdown of the element. Memory Foam – It is one of the most ingredients used in pillows and mattresses. It contours around the pressure points, providing the best support for your body. But, it gets hot and new products discharge a chemical odor. Wool/Cotton – These pillows tend to be quite firm and they repel dust mites and mould because of their hypoallergenic nature. Latex – The hardest of all the stuffing mentioned here. These pillows are good for keeping the back and the neck in the correct postures. They also resist dust mites and mildew. Orthopedic Pillows – Also known as cervical pillows, they come in various shapes and can be made of different materials. Their specialty is the extra cushioning on the neck area. They have many enthusiastic supporters but a 2007 study by the Canadian Institute for the Relief of Pain and Disability found nothing special about them. Positional Pillows – These have a unique design that provides comfort to all kinds of sleepers. Be careful to buy the right size for your body. 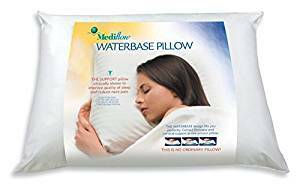 Water Pillows – These pillows use water as the stuffing material so that everyone can choose the density according to their comfort. Many chiropractors and physical therapists suggest this pillow to their patients. No matter whichever pillow you select, your body should not adapt to it but it should be compatible with your body. Also, if you are recovering from a cervical spine or neck injury, you may need to use different types of pillows at various recovery stages. To determine the support features, you should think about your usual sleeping position. However, in any case, water and memory foam pillows are great for all types of sleepers. The Harvard Health Department at the Harvard University suggested in a study that people with neck pain should use pillows with a firm, adjustable inner core. Both of them nicely curve around your neck and head, so there is no chance of losing their shape when you change the posture. Cervical pillows with a strong stuffing are also helpful. A study conducted by the Johns Hopkins University also gave opinions in favor of memory foam and water-based pillows. These are great because they buffer the shock to your vertebra and properly redistribute your body weight when you move. In short, the pillow should keep your neck aligned to the mattress and adapt to your sleeping posture. Cleaning and upkeep are not the first priorities because these attributes don’t make any difference in how well it supports your body. Nonetheless, these are important to make sure that you are sleeping in a healthy environment. Also, as these pillows are supposed to last for a long time, cleaning is mandatory at some point to keep mould and bugs away. A good-quality pillow should have a removable, easy-to-wash case and a core that is either washable or suitable for wiping with a damp cloth. Most high-quality neck pillows offer some extra features other than the basic support and maintenance facilities. For example, they come with hypoallergenic quality that saves you from dust mites and other allergic reactions. Some luxurious models come with a bamboo cover that gives a soft, lush feeling. It is also removable and washable, so there will be no issue with the cleaning. Another admirable feature of the good pillows is the eco-friendly nature. The inner core does not contain any heavy metals like lead and mercury; therefore, does not pollute the indoor air. 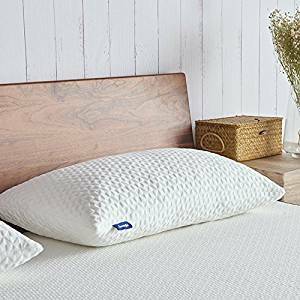 The CSP-03 Memory Foam pillow from Perform Pillow is one of the best among the products listed here due to its unique engineering and eco-friendly materials. It’s a Medium-profile pillow but you can also choose the Thick and Thin profile versions at the same price. To get the best support from this pillow, you should choose the thickness based on your body size. The medium profile offers the best for back sleepers while the thin profile will suit the best to children and small people. The think profile will be better for side sleepers. The pillow has two different thicknesses for two sides (the thicker side is 4.25 inches and the lower side is 3 inches), ensuring the best comfort during your sleep. 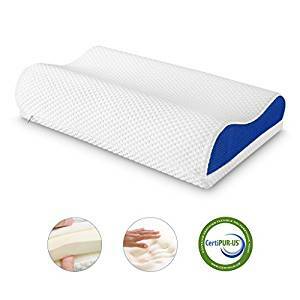 If you are recovering from a neck injury or suffering from cervical disc degeneration, this pillow will gift you the forgotten experience of waking up in the morning with no pain in your neck, shoulders, arms, and hands. The pillow is super comfortable and the plush bamboo cover will take it to another level. It is so soft and smooth that you will want to cuddle on it all day long. 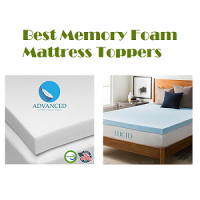 Memory foam is not something that you can put in a washing machine or use a dryer because it will break down the technology with which the foam has been crafted. This pillow is already hypoallergenic and resistant to dust mites. But, if you are going to use it for a long time and when you do that, you will need to clean it at some point. You can clean this pillow by soaking it into hot water. Submerse it in a sink filled with water and let the water run from the faucet to over its surface. Move it around and rub gently until you cover the entire pillow. Then, let it air dry outside or in a well-ventilated area. The Kool-Flow bamboo cover is removable and machine-washable. Dust mites are everywhere, but you certainly don’t want them to your pillow. In fact, you don’t want anything in it that may trigger an allergic reaction. The CSP-03 is hypoallergenic, which means you don’t need to worry about these things. The memory-foam and bamboo cover is eco-friendly and made without formaldehyde. The materials also don’t discharge any chemical odor. 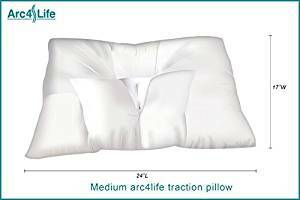 The CLTraction pillow from Arc4life is for anyone suffering from neck pain. It looks a bit peculiar but this weird- looking pillow will be your answer to the aching feeling in the morning and the lists of discomfort that come with it. Priced at just below $100 is expensive but it is one of the best products in the market that work great for all types of sleepers. The CLTraction has an indented center with sculpted sides that vary in shape, providing the right assistance for any sleeping position. It improves your posture as the recessed center helps to restore the normal neck C-curve. The unique shape and design of the CLTraction cradles the head and lifts the head away from the shoulder. You sleep better and get a good night’s rest due to the proper ergonomic shape of the pillow. It works best for the back sleepers but side sleepers can be benefitted too as its soft wings keep the head at the right height, allowing the shoulders and the neck to relax. It is seriously helpful in relieving strain and releasing pressure from the muscles. The pillow won’t relieve your pain overnight. So, don’t expect anything miraculous. It requires some adjustment period and you may experience some muscle soreness initially. However, things will get better over time and you will wake up without any pain in the morning. The CLTraction comes with a polyester/fiber filling. The material is hand-rolled into every single pillow, for ensuring a precise shape and top-notch neck support. The polyester, latex-free core is non-allergenic, so you won’t experience any stuffy nose or runny eyes in the morning. Also, the core is machine-washable, relieving you from the hassle of applying any special washing technique. The CLTraction reduces snoring because it allows your head and neck to stay in a natural posture, keeping your nose’s air passage unrestricted. Also, it keeps the cervical spine aligned, promoting better blood circulation through the muscles. The first words come to your mind after seeing the down alternative pillow from Duck and Goose are – stylish and aesthetic. 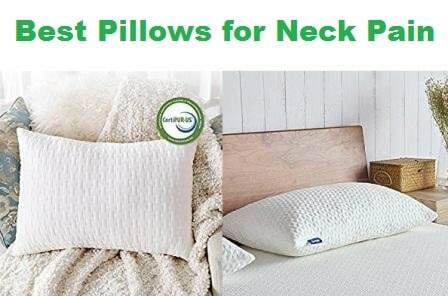 However, the pillow is also good at what it is made for, taking care of your neck to allow you a good night’s sleep. It also comes at a very reasonable price – just less than $50. Morning neck pain can last all day long, growing into an annoying headache that leaves people irritable and tired. Well, you can now say goodbye to those painful nights and mornings. With this down alternative pillow, you will have a fantastic sleep, feeling rested and energized in the morning. The pillow cover is made of a stylish jacquard print material with nice piping and double needle stitching. The cover is 100% cotton featuring high-quality microfibers and higher-grade 300 thread-count. The inside material is polyester. The pillow is very soft and cushiony. But, if you insert it into a smaller pillowcase, it will feel hard like a rock under your head. Otherwise, it feels fluffy and contours nicely around your neck, head, and upper shoulders. Although, a smaller pillowcase can come handy if you want medium to firm density. 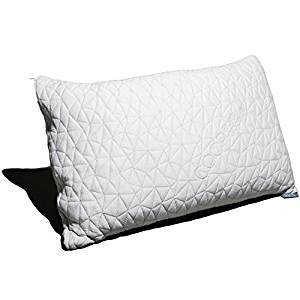 The outer case of the pillow is cotton and inner filling is 100% siliconized blown cluster polyester. The material feels like soft down and it keeps dust mites and mould away because of its hypoallergenic nature. As the inner material is not memory foam, you can put the pillow inside a washing machine. However, hang it for air dry after the cleaning as electric dryer can ruin its texture and softness. Duck and Goose offers a two-year warranty for this product. So, you can have the peace of mind that you are not wasting your money on some low-quality products. The 2-pack pillows come with a PVC bag. Just place them inside and zip the bag, they will be ready to carry around without any hassle. The shredded memory foam pillow from Coop Home Goods is here to give you the comfort of both worlds – memory foam and down pillows! It will cradle your neck to sleep while allowing you to have the proper posture no matter whether you are a back, side, or stomach sleeper. The price of a standard-sized unit is just above $50, which is quite reasonable. Memory foam and latex pillows are notorious for creating heat buildup and waking up people in the middle of the night with a hot flush. Down pillows don’t have this issue but they lack the proper support that leads to neck pain. This shredded memory foam pillow tries to solve these problems while cashing in on the advantages of both types. The shredded foam is springy that always keeps its shape and the pieces have enough space between them to allow greater ventilation. You can even take out or add more shredded pieces to adjust the density and firmness to your comfort. Some sleepers still complain about feeling hot but this may happen due to the cotton interlock liner. Also, hot or not, you will definitely like the plush feel of the bamboo cover, which is made of a mix of polyester and rayon. As you can adjust the density, it will never flatten to cause the neck soreness or stiffness. The materials are hypoallergenic and resist the buildup of mould and attack of dust mites. However, if you need to wash it, just throw in the washing machine. Coop Home Goods offers a 5-year warranty with a guarantee that it will not flatten after washing in the machine. What’s even better is a 30-day satisfaction guarantee. You will get your money back with no question asked. Coop Home Goods boasts of using CertiPUR-US certified foam material. It is going to last for a long time without emitting any detrimental chemical ingredient or heavy metal. The cervical support pillow from Nature’s Guest incorporates advanced technology into its engineering. It is a powerful sleep aid that not only makes you feel rested in the morning but also pain-free neck and shoulders. It provides superior bedding comfort and guarantees the sleeper’s satisfaction. The engineering and shape of this pillow is top-notch. Nature’s Guest applies a contoured design (The patent of which is currently pending) that provides great assistant to the spine. You will be able to maintain a proper spinal alignment and correct posture for the head and neck while sleeping on this pillow. The gusseted edges and indented center are ideal for back and side sleepers. The dent has enough depth to prevent your head rolling from side to side, which assists people who have the habit of shifting from back to side sleeping position. It has 3-inch of indentation on both sides, so you can effortlessly move from back to side no matter which side you have slept on. Also, you can adjust the density of the filling according to your comfort. The dual zipper design gives you access to the core material. But, if you are not an expert, you may not be able to rearrange the material to your desired firmness. In that case, you have to contact the company and they will send you more filling immediately. Nature’s Guest uses high-grade cotton fabric as the pillow cover and microfiber-filled core material. It is hypoallergenic but some people could still have an allergic attack because of the pre-processed fabric. You could wash the pillow in case it creates allergic reactions. You machine-wash it but handwashing is recommended for longevity and better conservation of the quality of the materials. Another great feature is the 100% satisfaction guarantee. If you don’t love it, return it within 90 days and get the full money back. The company takes pride in featuring all natural materials in this pillow. There is no harmful chemical or PBDEs (flame retardants). The zippered plastic bag for storing the pillow is a blessing for these people who travel a lot and want to carry it with them. Marnur boasts of a contour memory foam pillow that is compatible with all types of sleepers. 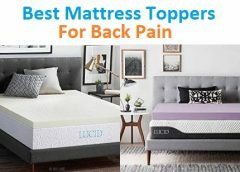 It is good for back and side sleepers and won’t disappoint even if you sleep on your stomach. With a unique design and affordable price, the pillow could be the one simple solution to all of your sleep-related problems. The pillow comes with a special shape, designed to pamper all types of sleepers. It cradles your head and neck and helps back sleepers to experience having their neck curved and chin pressing downward, which are responsible for serious neck ache in the morning. It contours around the natural curve of the neck while the center dent gives the head the perfect support. Your thoracic spine will just thank you for the wedge extension and the armrests will be great for the hands to stay relaxed. All the grooves and ridges of the pillow are consistent with the neck and head anatomy. The design is more scientific that is supposed to contour the body shape, release the body pressure, and not creating any obstruction to blood circulation. It is also good for individuals who frequently change their positions throughout the night. However, side sleepers with a petite body could find the wedge extensions too thick and higher to be comfortable. The pillow is made of premium-grade memory foam that retains the pillow shape. It is also breathable and protects your skin and allergic reaction by preventing mildew and dust mites. The high-grade cotton cover also feels soft to touch and does not contain anything harmful to the skin. You have to hand wash the pillow with water and hang it outside for air dry. Machine washing will break down the memory foam. The pillow could discharge a chemical-like odor after taking out of the box. You have to keep it in a well-ventilated room for 2/3 days for the smell to disappear. The pillow comes with a zippered pillowcase (made of rayon and polyester). It will come handy during traveling. You can machine wash this bag and reuse. Mediflow has been serving people with neck problems with their waterbase pillows for over the last two decades. The 1006-06 Original waterbase pillow is designed to provide the best care for your cervical spine and treat the neck pain along the way. The price is reasonable, and you never have to worry about the compression of the filling because it’s just water and it’s free! The pillow uses a waterbase technology that helps it to nicely wrap around the shape of head and neck and guarantees the maximum comfort. When you move, the water also moves and adjusts to the new posture. It means that you will get continuous support all night long. The 1006-06 Original waterbase pillow improves the quality of your sleep. Mediflow claims it to be improving neck pain and good night’s sleep, which is backed by clinical trials conducted by the Johns Hopkins School of Medicine. The pillow has two sections – a thin waterbase at the bottom and a layer of fill (which could be fiber or memory foam) above it. You have to fill up the inner chamber with room-temperature water, use gentle pressure on the water pouch to remove the air pockets, and tighten the valve cap. The pillow is ready to use! Taking care of this Mediflow pillow is very easy. The outside cover is polyester that you can remove and wash in a washing machine. It is hypoallergenic, so there is nothing to worry about an allergic reaction. Cleaning the inner water chamber does not need anything more than just a damp piece of cloth. It will take a minute or two to dry and ready to use. You can use tap water to fill the pouch but the temperature should not exceed 100°F limit. You can keep the water without changing for up to a year. One problem with this pillow is that if there is a leak in the water bag, you can barely spot it before mould grows onto the surface. And, a leak in the valve can cause wetting the bed, leaving you with plenty of cleaning work. There is an anti-allergen pillow protector to protect the pillow from mould and other substances that cause allergic reactions. However, you have to purchase it separately. Mediflow offers a one-year warranty for any defect. Also, there is a 30-day money-back satisfaction guarantee. This SN-P001-Q pillow from Sweetnight could be a nice gift to a family member or friend who has been suffering from chronic neck pain. 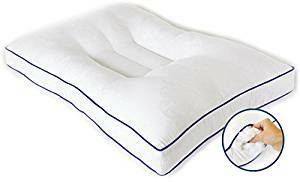 The contoured memory foam will give peace to the restless sleepers and help everyone to enjoy a morning without neck and back stiffness and pain. The less than $50 price won’t put too much strain on your wallet. Cotton and down pillows cannot keep your neck in a proper posture because they flatten after some time, losing the elevation and the ability to contour around the shape of your body. The SN-P001-Q pillow solves this problem with shredded gel memory foam enveloped in a breathable rayon cotton cover. The filling is a mixture of 90% gel memory foam and 10% comfort foam. So, unlike other memory foam pillows, it keeps you cool at night. However, people who tend to run a bit on the hot side can still feel some warmth due to the inner case and rayon cover. The great feature is the zippered case gives you access to the inner stuffing. If you find it too firm to your comfort, just remove some stuffing to your preference. The customized height and density will enhance your posture and keep your cervical spine completely aligned. However, removing the stuffing is a bit of lengthy trial and error process. Allergic people don’t have to worry because it is a hypoallergenic pillow. It keeps away bacteria, dust mites, and pet dander. It is also easy to care as you can machine wash the pillowcase. However, if you are not satisfied for any reason, Sweetnight promises refund with no question asked. The SN-P001-Q pillow has the CertiPUR-US certification for the memory foam used as the inner stuffing. It means that the foam does not contain any heavy metal elements or harmful substances like formaldehyde. Sweetnight offers a free bag with this product where you can keep the removed shredded foam. Remember to keep it away from children. The gel memory foam pillow could be your savior if you are continuously experiencing poor sleep due to discomfort in the neck or hot flushes. It lets you wake up properly rested and no annoying issue like stiff neck or pain in the shoulders and back. You will be surprised to experience the significant improvement in your sleep quality. 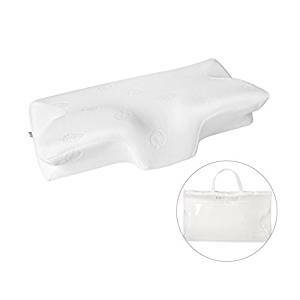 The Polt-gel-2018 is designed like a cervical pillow, featuring a protrusion on half portion of a side. The bulging part fills the gap between your neck and shoulder while the indented portion cradles the head. Due to this shape, it could be a lifesaver to those people suffering from whiplash due to a surgery or injury. You can tell the difference right after the first night! The pillow also works nicely for staving off a headache and disrupted sleep. 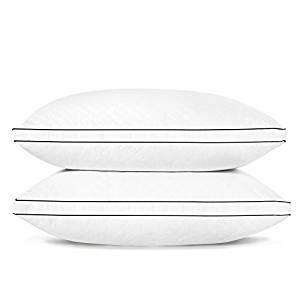 Most of the migraine pillows become flat fast but it stays firm without losing the softness for months. When the pillow holds its shape, it can provide the sleepers the kind of cervical support required to keep the head and neck aligned to the spine. Do you often wake up in the middle of the night to find that your pillow has turned extremely hot? Say goodbye to the problem because the Polt-gel-2018 has a layer of cooling gel pad on the inner core. It keeps the head cool throughout the night. However, the pillow is almost half in size of a regular pillow. The size is way too small for most adult people. Also, the memory foam core tends to release a strong chemical smell that is almost unbearable. You may have to keep it open in the air for several days for the stench to go away. The pillow is hypoallergenic and contains no latex, so there’s no chance of you waking up in the morning with red eyes, itchy skin, or stuffy nose. The pillowcase is bamboo fiber crafted with soothing Aloe Vera for creating a relaxing effect. You can put this cover into the washing machine. However, clean the inner foam core with lukewarm or normal-temperature water if needed. It is a medical pillow that provides multiple benefits – helping with migraines, spine alignment, neck issues, and hit flushes. The Sable brand is known for launching high-quality products that are fresh and inventive in nature and aimed at simplifying the life of the consumers. This shredded memory foam pillow is also designed with the goal of improving sleep and reducing neck and back pain. The pillow is made of shredded memory foam that is covered by an inner layer and a bamboo pillowcase. The outer cover is soft and gives a lush feel to touch. Shredded memory foam is soft too and you can remove them to adjust the firmness and density of the pillow. There are not many pillows that cradle the shape of your head and neck and evenly distribute the pressure of these body parts. Sable’s pillow does these things and it is great for any sleeping position. It could do wonder for people who have been suffering from chronic neck pain. They will be able to sleep through the night and experience a morning without any horrible pain the neck and back. People suffering from allergies can breathe a sigh of relief knowing that the pillowcase is hypoallergenic and the inner core is resistant to mould. You can have a sound sleep amid a healthy and clean atmosphere. The pillow is easy to care because you can machine wash the pillowcase and tumble dry it. However, wash the shredded foam pieces in normal water. Never use bleach to clean or iron to straighten the cover. Sable offers a lifetime warranty with a guarantee for 100% satisfaction for their products. 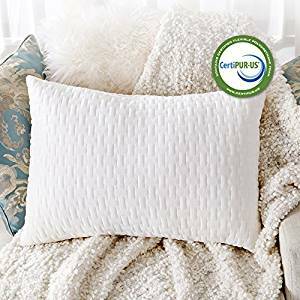 The pillow is CertiPUR-US certified, ensuring that there no harmful ingredients like PBDEs, heavy metal elements, and flame retardants. The pillowcase has a strong YKK #3 zip fastener that allows access to the inner materials without any hassle. Opening and closing the zipper are also super smooth. This memory foam contour pillow from CR is a game changer. Whether you have a bulging disc, whiplash, or any other neck injury, sleep on it for at least a week and feel the difference. It will bring noticeable improvement to your aching neck and make you feel energized in the morning by allowing a good night’s sleep. The memory foam pillow gets you covered if you are constantly awake, tossing and turning because of a hot pillow or hot flushes. The breathable outer cover, Jersey fabric inner cover, and memory foam core featuring AirCell technology improve air flow. They also don’t retain the body heat, so you will be able to sleep through the night even if the room atmosphere is hot and humid. With a medium firm feel, the pillow boasts of a contoured wave design where the higher end is 4.7 inches and the lower end is 3.5 inches. It comfortably caters to the needs of all sleeping postures but people with a large build may find it thinner and harder than the medium firm density. When it fits, it will be hard to find its replacement. The gel-infused memory foam allows the muscle around the neck, shoulders, and back to relax, reducing stress, stiffness, and pain. The ergonomic profile keeps the spine to its natural shape, promoting proper rest and support throughout the night. The new pillow could release a strong chemical odor. It is not harmful but if it bothers you much, keep the pillow in a well-ventilated place for several days. The super soft outer case is 65% polyester and 35% Tencel and the inner cover is premium-grade Jersey fabric. You can remove the pillowcase and wash it in the machine. However, the inner foam core is up only for spot cleaning with a damp cloth. Dry the pillow in a cool, arid area but avoid direct sunlight. The pillow is safe for your health as it comes with a CertiPUR-US certification. It does not contain any heavy metal or toxic ingredients. It also resists the growth of bacteria, mildew, and dust mites. Cr offers a sleep musk for free with this pillow. The combo will ensure that you get the night’s sleep without any disturbance. The HK-C-01 memory foam pillow from Comfort & Relax is so cozy that you will want to take it on your vacation or when visiting somewhere. It will work very well for those who have surgery or injury in the neck. Sleepers will also get comfort in case the old arthritis is settling in. At less than $40 price, it will give relief to the budget shoppers too. The pillow features a contoured shape design with 4.5 inches of higher loft and 4 inches of lower loft. The bulging part nicely fills up the void between the head and the shoulders, helping the muscles of these areas to relax. The two different heights are on the opposite side to each other. So, you can use the side that works for your body dimensions. 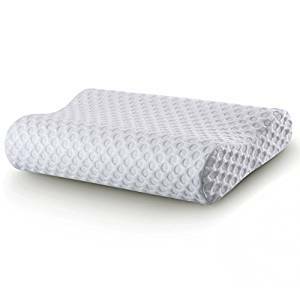 There is a gel pad on the memory foam core, which is covered by a breathable spandex fabric pillowcase. Together they enhance the air ventilation and disperse the body heat. As a result, the sleeper enjoys a cooler, undisturbed sleep the whole night. 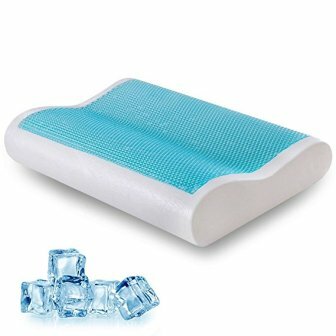 The gel does not create an ice cold effect but it eliminates the need for rotating or flipping the pillow even if the climate is warm. The unique design of the pillow suits all types of sleepers. Then again, the comfort level can vary person to person depending on their weight, size, shoulder width, and sleep position. Another plus point is the pillow is a good treatment against snoring because of its ergonomic shape. It does not cure it but reduces the loudness to a great extent. The pillow is safe for your health as it is antimicrobial and resists the growth of mildew and dust mites. In addition, you can remove the spandex external cover and machine wash it. The memory foam core is suitable for cleaning with a damp cloth. Never dry the pillow in an open place under the direct sunlight. Rather, keep in a dry, ventilated room and let it air dry. There could be a strong chemical stench when you take it fresh out of the box. However, it’s not toxic and it will dissipate after keeping it in an open place for a few days. Comfort & Relax offers a sleeping mask free with this pillow. The combo of both products will be excellent for having a good night’s sleep. Sleep just a week in a row on this pillow and wake up in the morning feeling properly rested and highly refreshed. It will make a world of difference compared to the normal pillows. You will get quality sleep and the contoured shape will dramatically improve your neck and upper back pain. It’s a budget-friendly product since the price is less than $30. Langria uses premium-grade memory foam in this product to provide a medium-to-soft firmness. However, it won’t suit the people who like their head get sunk into the pillow. 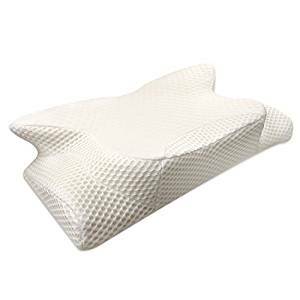 Like other orthopedic pillows, this unit also comes with a contoured design featuring one lofted and one lower end. The lofted portion nicely fills up the blank space between the head and the shoulders and helps the neck and shoulders to release pressure and rest properly. The one-inch detachable foam pad takes the height customization feature to the next level. People with a large build and heavier weight can attach it to the bottom of the pillow to get the correct elevation. The high and low ends are ergonomically designed to provide the orthopedic support. You can use any end based on your body dimensions. The memory foam pad is not too soft, nor too rigid, which is likely to suit most of the people. There are two hidden zippers that give you access to the inner foam core and the extra detachable pad. You can remove the covers and wash them in the machine. However, apply only spot cleaning to the memory foam pads and dry them in a well-ventilated room away from direct sunlight. The pillow requires at least 24 hours to inflate to its original shape after taking out of the box. Also, it could release a strong chemical stench and you have to air it for a few days to diffuse the smell. The pillow is environment-friendly and safe for human health because it has the CertiPUR-US certification. It ensures the product’s longevity and the absence of harmful ingredients. No more waking up in the morning with the persistent soreness or stubborn stiffness in the neck! The URBP03WC pillow from Songmics is here to take care of all the discomfort and pain caused by a bad sleeping posture. The pillow will keep the cervical spine in its natural position and allow you to have a good rest throughout the night with its advanced features. The URBP03WC pillow from Songmics saves you from those horrible nights when you can’t sleep because of the bending and twisting of the neck in a particular direction. Not all pillow can provide the right amount of support because they are not carefully designed to take care of your neck and spine. This one is certainly not one of them! You can adjust the firmness and height of the pillow by taking out of the filling (siliconized fiber) through the zippered pillowcase. The hyperfine siliconized fiber provides the correct support for neck and head because it has a great resilience. It does not get flatten so easily, which is the reason for this pillow to maintain a comfortable firmness. Sitting somewhere in the middle between being too soft and too rigid, the pillow will neither let your head sink down nor elevated it too high, which is just right to take the pressure away of your cervical vertebrae. The breathable cover is 100% cotton satin fabric that absorbs sweat. You can remove it and put in in a washing machine. In fact, you can put the whole pillow into the machine and tumble dry. However, be careful about not using any bleach and hot water (the maximum water temperature should not be more than 30°C). Songmics backs their product by offering a one year warranty. The microfiber filling is antimicrobial and free of allergens. Any individual suffering from an allergy can use it since there is nothing to trigger an allergic reaction. The materials used in this pillow are also resistant to stain and fading. Could feel too stiff to people who like their pillows ultra-soft. The cervical pillow from Maxchange is here to support all types of sleeping position by correcting the postures. The shape may appear to be a tad odd at the first look, but it has been carefully designed to ensure that all types of sleepers get a cozy, peaceful sleep. The price is just above $50, which is reasonable considering the wide variety of supports it provides. You can use the pillow in two ways – the back sleepers should lay on the upper side that has two horn-like extensions and mixed sleepers should utilize the other side that has room for armrest on both sides. You can even keep it under your chest and snuggle when you are watching movies or sports. The pillow has the perfect height to raise your head, freeing up your trachea and allowing you to breathe freely. As a result, the snoring will reduce to a significant extent. However, some people, especially who have a petite build, may find the elevation too much. As the pillow supports several sleep positions, you will enjoy an uninterrupted sleeping despite having the habit of changing postures constantly. It contours nicely around your neck and head and relieves you from several problems triggered by bad postures and less sleep – migraine, fatigue, neck and back pain, and feeling stressed. You can wash the pillowcase in the washing machine but the water’s temperature should be less than 40°C. Clean the inner foam with a damp cloth. Don’t put it in the machine and never expose it to direct sunlight. Let it air dry in a well-ventilated place. Also, don’t try to iron it. Maxchange promises an unconditional refund within 90 days for this product. Unfortunately, the pillow does not provide any extra feature. It also does not claim to be hypoallergenic. So, use it carefully if you are allergic to something.